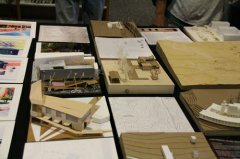 Documents and models by the 12 architecture students who visited Silver City this summer. UNM School of Architecture Professor Tim Castillo, a native of Grant County. The public event for those interested in the Plata Silver Studio took place Saturday afternoon at the Western New Mexico University Miller Library. University of New Mexico School of Architecture Professor Tim Castillo, a native of Grant County, and Woodbury University Architecture Professor Stan Bertheaud brought students to the area this summer for two weeks in a collaboration with Western. 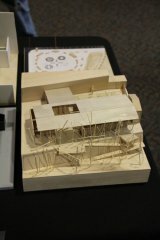 "We brought the students here to think about how we, as designers and architects, can give a different perspective," Castillo said. He explained that the Dean of the UNM School of Architecture, Geraldine Forbes Isias, and WNMU President Joseph Shepard began the collaboration about a year ago. "We're excited about this evolving project," Castillo said. "I give a lot of credit to Tim for his vision," Shepard said. "His hometown is here. "This all began as a religious experience, believe it or not," Shepard said. "Brother Bernard, up at the monastery, was an architect in New York, but couldn't get reciprocity here in New Mexico. We met with UNM architects and had a coming together of minds. "Universities want to be everything to everybody, but we can't," Shepard said. "Sure, we'd love to have a school of architecture, but we can't afford it. "Our community is really good at creating plans," he said, "but it's just paper and we're also really good at doing nothing with them." Shepard said this year, the dozen students came from UNM and Woodbury to do research. "Next summer they will move forward and the last summer will be the implementation." "We at the university just developed a master plan," Shepard said. "You may have seen the trees being cut down. They had beetles and were diseased. I wasn't happy to cut down trees, but we thought about what we could do with the spot. We will plant Arizona ash for a canopy. By the end of summer, we will have planted close to 150 trees. They will be beautiful in 10 to 20 years, but we have to have the vision now. "Thank you for the willingness to do this collaboration," Shepard thanked the students and the professors." "I grew up here," Castillo said. "Being able to come back is about meeting people again. I grew up with Howie. It's great to have the connection, with him doing great things for the community." 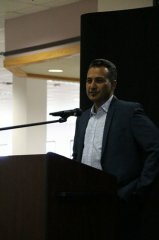 Morales said the economy in New Mexico is struggling. "We think it's opportunities like this that give us fresh eyes to see things we're not seeing. Economic development is often about what we can attract. We forget what we have within. Many things we have are cultural. The rodeo was in town when the students were. Few of them had ever seen a rodeo. "I was excited to listen to the students," Morales said. "It's beautiful to have someone like Tim who grew up here. We are proud of the community we were born and raised in and are proud to see the opportunities here. I want to recognize the advocacy of Priscilla (Lucero, Southwest New Mexico Council of Governments executive director) for giving up her Saturday to be here." Bertheaud said he grew up in the South, but has now spent 20 years in California, so he's now a Californian. "I grew up in small towns. Tim and I share a love of film, so we work well together." Castillo said he had two classes at Western and has now spent 14 years at UNM. "We started the studio going through film and storytelling." Chris Dimeling and John Shannon of Woodbury University gave their perspectives. "I was looking for the most immersive experience," Dimeling said. "We all elected to come here. Others went to Europe, Mexico City and China. We want to learn. We want exposure. We map situations, pull them apart and rebuild them. We focus on miniscule details. We live on an unhealthy amount of coffee, and we present our work to our peers and faculty." Shannon said coming up New Mexico highway 90, "I saw the rain in the distance, and then smelled the rain falling on the asphalt. Everything starts in black and white and then the colors come out. The rodeo was unbelievable. Overlooking the mines." He read a poem the students had created. The SC+MArch is a combination of Silver City and a masters in architecture. Shannon said the studio is a catalyst for rural economic development while giving students hands-on design and build experience. "We're super proud of our students," Bertheaud said. "Five of the 12 are here today. I want to make it clear that Plata Silver Studio is not a studio where you come in and leave. We have made a three-year commitment. Our first week here, we gathered information. The second week, they took off with ideas. This is just the beginning." "We wanted to let the students tell us what they saw," Castillo said. "There were three groups, with three themes-journey, place and detail." Bertheaud said he wanted to make sure everyone knew an additional collaborator, Mary Hardin, architecture professor from the University of Arizona, is working with the group. He said the idea of design-build is that the students design something and build it. "We want that to be part of this next year, with the design with an old component." He showed several slides of what other mining towns have done. "Telluride features a film festival and culinary arts," Castillo said. "Western wants ways to engage in Silver City, and culinary arts seems to be a feature of the town." Bertheaud talked about the city of Savannah, Georgia, where the College of Art and Design is interspersed throughout the city. 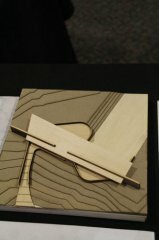 "Western would like to have a storefront to connect the city and the campus." "We were trying to figure out where the town is going," Castillo said. "We had Priscilla, Howie, Town Manager Alex Brown and the assistant manager James Marshall, John Rohovec of the New Mexico Arts Council and Kevin Cook of Freeport-McMoRan talk to the students." "We held a charrette," Bertheaud said. "It's a quick gathering to solve a problem." "As architects we are constantly making things-drawings and models. We created a speculation map," Castillo said. "We didn't come with preconceived concepts," Bertheaud said. "The students heard that what was needed was stuff for kids and a way to engage them. Students created a map of events here." Castillo said, in exploring the culinary, they looked at Durham, Ontario, where there is a culinary school. 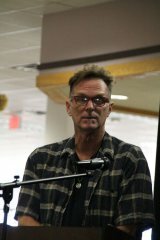 "We heard about utilization of the Big Ditch, Hudson and Broadway. The students created a rendition of a culinary school that hangs over the Big Ditch and has an outdoor plaza. They talked about mobile kitchens. They also talked about a mobile water park for recreation." "None of these is real," Bertheaud said. "We are just dipping our toe into Silver City. These are concept, that why they are called speculations." Castillo said another model was of an archery range at Santa Clara and Fort Bayard for a regional venue. Bertheaud talked about the old Silver Skate building and how a speculation could connect it to the Big Ditch. "We also looked at Mille's Bakery, which could be used as a culinary venue," Bertheaud said. "Hopefully we can transform something in the next two years." Castillo said a goal is to brand Silver City. Bertheaud said: "Plata Silver Studio is our effort. It is who we are. The website findingrural.com is our mission statement to bring in other architects. We hope it evolves from Plata Silver Studio. In the future, we hope we can get some Western students involved, especially in the design-build. Then we'll have a convocation and a real big party." "Year three will be the design, built and a publication," Castillo said. "We want to establish an ongoing center/institute for Finding Rural." Barbara Smith, Silver City resident, suggested the team look at the St. Francis Newman Center, which is a combination building from Santa Rita, with the rest built by the parishioners. "Take a look at it. We need more room, but can't afford anything." Bertheaud said that was the exact sort of information they need. "We have to find the right things to do." "We're really excited about the next two years," Castillo said. "We thank you for the opportunity." Morales asked if any attention had been given to open spaces and trails. Shannon said one of the students was focusing on the trails near La Capilla. "We also feel like the Continental Divide Trail is a real opportunity," Betheaud said. "We've thought of a Continental Divide museum at the overlook of the mine in Tyrone," Castillo said. An audience member said preserving historic structures in Silver City is difficult, because private industries have problems. "There are tons of these jewels around the community," Bertheaud agreed. "We are not preservationists, but we understand that they are part of your culture." Shepard said he would love to see the town have a culinary institute. "A modern building over the Big Ditch, no, but a historic building, renovated into a culinary institute, yes." Shelby Hallmark, resident, said the local Trails Group has a trails plan, but highway 180 dissects Silver City. "We need trails to get from the south to the north side of town." "Architects love bridges and connections," Bertheaud said. Bob Wilson, resident, said he is really excited about the options, "but you've mentioned nothing on the environmental community, which got a Preserve America grant. And have you thought about the Waterworks building as an environmental institute?" "Sustainable is engrained in what we do now," Bertheaud said. "We want to maintain the natural environment and enhance it. You have tons of outdoor things to do, but no real place to find out about them." He confirmed they had looked at the Waterworks building. An audience member said student-learned history seems like a missed connection with the Big Ditch. "We understand the Big Ditch, and we also understand it is a water collection feature," Shannon said. Frank Drysdale, resident, asked if the professors and students were aware of all the plans that have been completed in the town. He listed quite a few. "And Silver City is woefully non-compliant with the ADA. UNM medical students did an assessment and found that only 20 percent of the town is ADA compliant." He said residents have some frustration with the lack of implementation of all the plans. "Do you know that Silver City operates under the last territorial charter? It had a vision of making it an urban center. It also has circulation problems and some needs. We need more cures." "We don't want to do a plan," Bertheaud said. "Mine and Tim's job is to focus on what we can do in small interventions. We want to make things happen and do a design-build." "What we're doing is always with the idea of design-build," Castillo said. "We're here to expose students to opportunities." Herbie Marsden, resident, said Silver City is a nice place "for some of us." He talked about a recent shooting and a recent stabbing. "There's a problem between wealth and poverty. Mining comes and goes. The town never has really dealt with the cultural, economic and social divide. Maybe architects can't do anything about it. They can create a nice building, but there will be a seething mass of anger in parallel." Dimeling said the group has no magic wand. "We're not naÃ¯ve to polarization. It's not unique to Silver City. In reality, we can study it, but you relocated here. But relocations are not raising children here. We want to retain the population, and we have ideas on how to keep the kids here. Culinary institutes are for those who can't get opportunities here now." "I respond that architecture cannot solve such major problems," Castillo said. "Priscilla brought up the economic disparity in one of our conversations. We are makers. With educators, we think in different ways. We kicked around a mobile unit to bring to students the concept of architecture. I understand the disparity, and it is systemic." The presentation ended, and people stood around and talked about ideas for another half hour or so.